If you need to whip up something super delicious and super easy this summer these are always a huge hit. The cookie batter is made so quickly with a cake mix and two other ingredients. Today I make them with homemade buttercream but I have made them plenty of times with a container of store bought icing. Both ways are delicious! You really can’t go wrong with these tasty treats. These festive cookie sandwiches are perfect for your backyard barbecue this summer. Pack some up in your picnic basket to go watch fireworks. 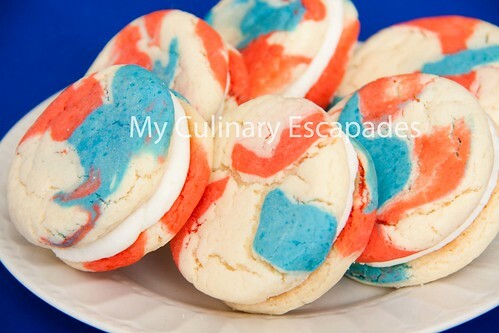 There are so many recipes I make where you have to do tons of steps; roll out the dough, cook the cookies, cool the cookies, make royal icing, dye it lots of different colors, painstakingly decorate cookies, let dry and do the pile of dishes. Call me lazy but there are plenty of days where I enjoy a recipe that uses one bowl, a wooden spoon, a scoop and a glass. Combine cake mix, oil and eggs in a bowl and mix together with a wooden spoon. Remove 1/4 cup of the dough into another dish and combine with the red food color. Remove an additional 1/4 cup to another dish and combine with the blue food color. 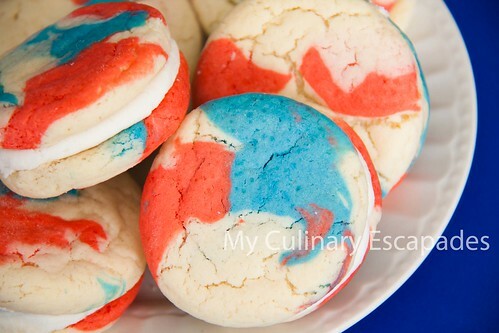 You should now have three bowls of dough, one with white, one red and one blue. Scoop 1 tbsp of white dough and pinch off 2 pieces of red dough and two pieces of blue dough. Add them randomly around the white dough and roll into a ball. Place on a cookie sheet lined with parchment paper. These cookies spread a lot so it is best to lace cookies in 3 rows of 3. If you make lots of cookies you should invest in some nice scoops. I have 4 different sizes and they are worth their weight in gold. Not only are they super easy to use but they make all your cookies a uniform size, which is valuable when you have 4 kids and each of them want the biggest cookie. Using the bottom of a glass press the rounded cookies into flat disks about 1/4 inch thick. Bake at 350 degrees for 6-8 minutes. The cookies should not brown at all and will look cracked on the top. Let them rest on the cookie sheet for 2 minutes before removing to a cooling rack. To make the icing cream the butter and shortening until completely incorporated. Mix in the vanilla and butter flavor until well combined. Add powdered sugar and stir until crumbly. Add milk 1 tbsp at a time until the desired consistency is achieved. You are going to want a pretty firm icing for these cookies or the icing will fall out the sides. Place your icing in a disposable icing bag. For these I don’t use a tip I just snip off 1/2 inch of the bag and get ready to pipe. Once the cookies are cooled turn one over and pipe icing in a circular motion. Place a second cookie on top and gently press down. Continue filling all the other cookie sandwiches with icing until all the cookies are done.